A Key to Uncle Tom's Cabin is a book by American author Harriet Beecher Stowe. It was published to document the veracity of the depiction of slavery in Stowe's anti-slavery novel Uncle Tom's Cabin (1852). First published in 1853 by Jewett, Proctor & Worthington, the book also provides insights into Stowe's own views on slavery. After the publication of Uncle Tom's Cabin, Southerners accused Stowe of misrepresenting slavery. In order to show that she had neither lied about slavery nor exaggerated the plight of enslaved people, she compiled A Key to Uncle Tom's Cabin. The book was subtitled "Presenting the Original Facts and Documents upon Which the Story Is Founded, Together with Corroborative Statements Verifying the Truth of the Work". 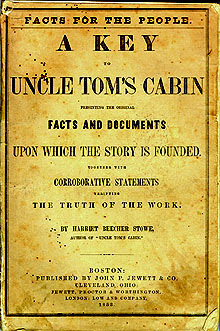 The reaction of Stowe’s contemporaries to A Key to Uncle Tom’s Cabin was very similar to the reaction to Uncle Tom’s Cabin, with both very positive and very negative reviews. The responses of abolitionists and Northerners in general were among the positive, lauding the proof of the evils of slavery and the confirmation of the truth of Uncle Tom’s Cabin. The great interest in Uncle Tom’s Cabin in England also transferred to the Key. One English review of the 1853 publication called it a "marvelous book, more so if possible than Uncle Tom’s Cabin itself". This same review also commends Stowe’s self-control and character. This impression of Stowe and the reception of the book is much different than the reaction to the Key in the South. The pro-slavery response to the Key paralleled the response to Uncle Tom's Cabin. Despite Stowe using documented examples to make the Key a verification of the truth of Stowe's depiction of slavery in Uncle Tom's Cabin, most Southern reviews still claimed that Stowe was misrepresenting slavery and exaggerating the cruelty of the institution. A review in the Southern Literary Messenger called the Key a "distortion of the facts and mutilation of the records, for the sake of giving substance to the scandalous fancy, and reduplicating the falsehood of the representation". Although these reviews claimed that Stowe was misrepresenting slavery, they did not accuse Stowe of using false documentation. Rather they claimed that the examples that Stowe provides are the most extreme instances, which she gathered to give the worst possible impression of the institution of slavery, and of the south. One critic, William Simms, accused her of using faulty argumentation by gathering facts to prove her assumption, instead of forming assumptions based on facts. Another pro-slavery reaction to both Uncle Tom's Cabin and the Key to Uncle Tom's Cabin was, rather than critiquing the work itself, a critique of Stowe's character. Many reviews made insinuations about what sort of woman Stowe must be to write about such events as were found in the Key. One review by George Holmes questioned whether "scenes of license and impurity, and ideas of loathsome depravity and habitual prostitution [are] to be made the cherished topics of the female pen" and appealed to women, especially southern women, not to read Stowe’s productions. In spite of the varied reviews of A Key to Uncle Tom's Cabin, it sold quite well. It was a bestseller when it first came out, perhaps simply as a result of the obvious connection to Uncle Tom's Cabin, and Stowe's celebrity. Although it never sold to the quantities of Uncle Tom's Cabin, it had sold 90,000 copies within a month of being published. ^ "A review of Key to Uncle Tom's Cabin". The Eclectic Review 4 (May 1853): 600–617. Rpt. in Nineteenth-Century Literature Criticism. Ed. Laurie Lanzen Harris. Vol. 3. ^ a b Simms, William Gilmore. "Stowe's Key to Uncle Tom's Cabin". The Southern Quarterly Review 8.15 (July 1853): 214–254. Rpt. in Nineteenth-Century Literature Criticism. Ed. Laurie Lanzen Harris. Vol. 3. ^ Holmes, George Frederick. "A review of A Key to Uncle Tom's Cabin". Southern Literary Messenger 19.6 (June 1853): 321–330. Rpt. in Nineteenth-Century Literature Criticism. Ed. Laurie Lanzen Harris. Vol. 3. ^ Railton, Stephen. "Uncle Tom's Cabin & American Culture". University of Virginia. Retrieved 15 April 2011. ^ Geary, Susan. "Harriet Beecher Stowe, John P. Jewett, and Author-Publisher Relations in 1853". Studies in the American Renaissance. Ed. Joel Myerson. Boston: Twayne, 1977. 345–367. Otter, Samuel. "Stowe and Race". The Cambridge Companion to Harriet Beecher Stowe. Ed. Cindy Weinstein. Cambridge Companions to Literature (Cctl). Cambridge, England: Cambridge UP, 2004. 15–38. ISBN 0-521-82592-X, ISBN 0-521-53309-0. Wikimedia Commons has media related to A Key to Uncle Tom's Cabin. Full text of A Key to Uncle Tom's Cabin (1854 edition) at the electronic text center of the University of Virginia. It is part of "Uncle Tom's Cabin and American Culture: A Multimedia Archive" directed by Stephen Railton. Accessed July 22, 2006.